Ever since the beginning, fishing and boating have been as much a part of Ocean City, MD as sand and surf . Not only did Ocean City begin as an isolated fishing village, its since grown into the White Marlin Capital of the World, so its safe to say fishing is a big part of life here. With Ocean Citys proximity to the Gulf Stream, big game fish are in abundance and if you venture offshore in Ocean CIty youll have the chance to land bigeye and yellowfin tuna, bluefish and wahoo, mako, mahi-mahi, white marlin, blue marlin and even the occasional sailfish. If you stay close to shore check out any of the ocean and bayside fishing piers and drop your line and attempt to reel in flounder, trout and sea bass. 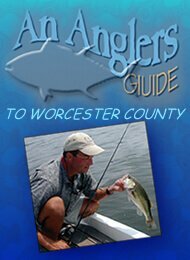 Click on the guide to the right to see Worcester County’s Anglers Guide. *Effective 1/1/11 Fishing License Required for Atlantic Ocean and Coastal Bays. Call 410-656-9526 or visit http://dnr.maryland.gov/service/fishing_license.asp for more information. However, there are now two free fishing areas on the coast: Northside Park, town-owned pier and park at 125th Street, and Chicago Avenue, bulkhead between 2nd and 4th Streets do not require fishing licenses to fish in those areas (anglers must still register with the state for free by phone 1(855)-855-3906 available 7 AM to 7 PM every day, or online here:https://compass.dnr.maryland.gov/dnrcompassportal). Since the Ocean City Inlet was cut in the storm of 1933, Ocean City’s commercial and recreational boating fleets have exploded. Not only can you rent traditional head boat and charter boats, but you can also enjoy a plethora of recreational boating activities in Ocean City. Grab your family and friends and spend an afternoon cruising the bay on a pontoon boat, hope on one of the rocket boats and speed up and down the shoreline, or paddle around in a kayak taking an eco-tour. You can rent boats of all sizes for ocean going and for river meandering and Worcester County is laced with public boat ramps where you can launch your own trailerable boat and marinas where you can bring your larger fishing boat and dock. If you need a place to store your boat, Ocean City has you covered there as well.